We are now coming into that time of the year in Australia where the weather is getting cooler and the days are becoming shorter. Where I live, it can be very hot durning summer, so I’m pleased to say I am loving the weather change! 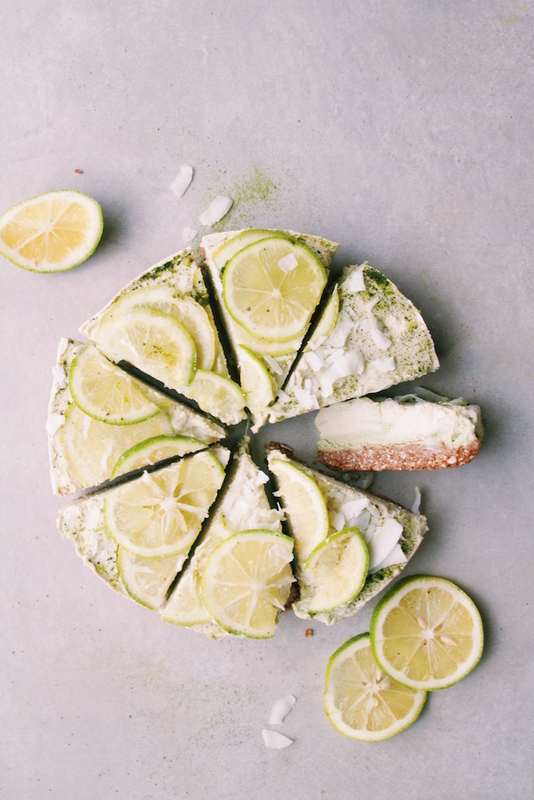 With that, I present to you this pretty, immune boosting green tea matcha & lemon cake! Matcha is a powdered green tea that is mostly grown and produced in Japan. It is known to be rich in antioxidants and is used in recipes like matcha lattes, cakes and smoothies. When searching for matcha tea powder, choose a high quality certified organic one, so you can be sure there are no hidden nasties. At the moment, I’m liking the taste of My Matcha Fix, a local company that sources high quality organic matcha from japan! They have lots of information about matcha that you can have a read of too! 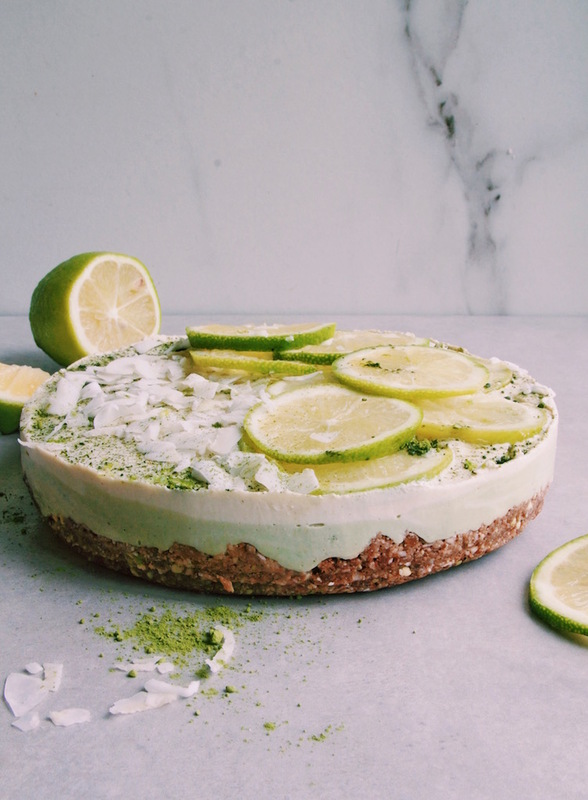 Matcha and lemon flavour combo is pretty much – perfection! Lemons provide a zesty refreshing flavour to this cheesecake and as a bonus, it also contains vitamin C and aids digestion. You’re probably familiar with my vegan cakes – if you have been following me for a while – which are all dairy, gluten and processed sugar free. I’ve made them plenty of times for my friends and family and everybody loves them! If you are going to indulge in a treat, why not make a cake that not only tastes delicious but is kind to your body as well!! You will need a food processor or high speed blender + spring-form tin. For the base, Place all ingredients into a blender and blend until combined. Line the bottom of a spring-form cake tin with baking paper and transfer base into the tin, pressing down until evenly distributed and place in freezer. For the filling, Add all ingredients (EXCEPT THE MATCHA) and blend until smooth. Pour out half the mixture and transfer into a bowl. Add matcha into the blender with the remaining mixture and blend until combined. Transfer the matcha layer onto the base and evenly distribute. Add the non matcha layer onto of the matcha layer and spread out evenly with back of spoon. It's ok to combined the two layers a bit as it will give a nice effect to the cake. Add some slices of lemon if you wish then transfer into freezer to set for at least 4 hours or overnight. Once it has set and you are ready to serve, take out of the freezer and let it sit for 15-20 mins to defrost. 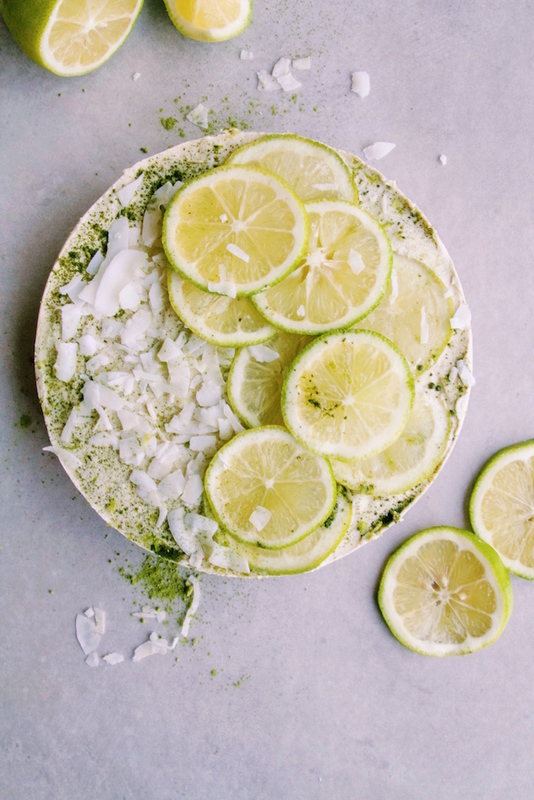 You can them add extra lemon slices, matcha and coconut flakes to decorate. Store in fridge if you want to keep a soft consistency or store in freezer to last longer.